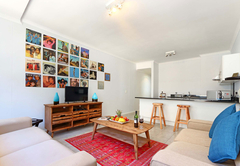 The Amistad is a property providing self catering in Muizenberg for up to 4 guests visiting the False Bay region. 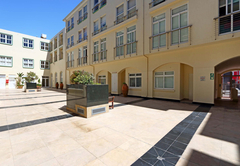 Situated in Muizenberg, Amistad Apartment provides self catering accommodation for two adults and two children. Muizenberg is well known for its beaches, Surfers Corner, trendy restaurants and laid back atmosphere. 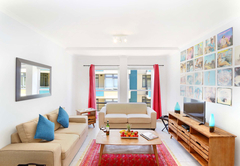 The Amistad Holiday Apartment has one bedroom and one bathroom. The bedroom is furnished with a double bed and there is a sleeper couch in the lounge for children to sleep on. 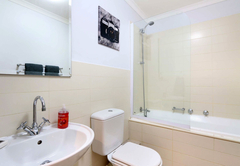 The bathroom has a bath / shower combo, a toilet and basin. Bed linen and towels are provided. The open plan living area is beautifully decorated and comfortably furnished. The lounge has couches and a TV. There is a breakfast bar with stools which for a cosy place to enjoy a meal. 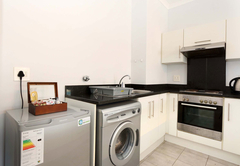 The kitchen is fully equipped and includes a washing machine, stove, oven, fridge, microwave, cutlery and crockery. Response timeThe Amistad typically responds to requests in 5-10 minutes.